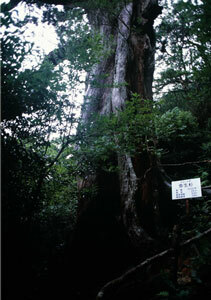 In Yakushima , cedar trees are older than a thousand years calls Yakusugi which means the cedar of Yakusima. 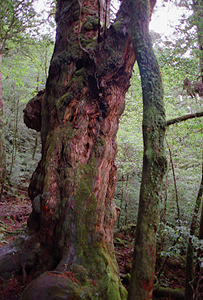 Some of the oldest Yakusugi have own name such as Johmon-sugi the most famous Yakusugi tree stood on the Ohkabu-hodo trail. But it is not easy to meet, since it takes over ten hours roundtrip for there. 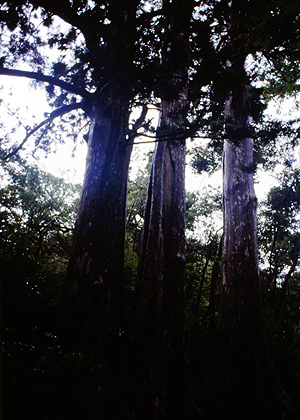 Alternatively some Yakusugi trees in Yakusugi-land are preferable to visit with a car. 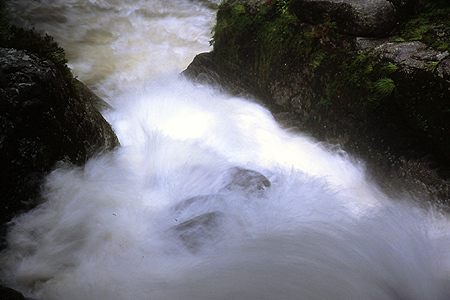 Yakusgugi-land is located along the large stream of river Anbo with the forest around the 1000m sealevel. From the Anbo the second largest town located east of the island, the Anbo-rindo forest road running up to inner area of the island. Going up 30 minutes with the road and passing the Ohdate pass where a branch of the Arakawa rindo, You reaches the entrance of the park. Be care about that the Kigensugi isn't in the park. 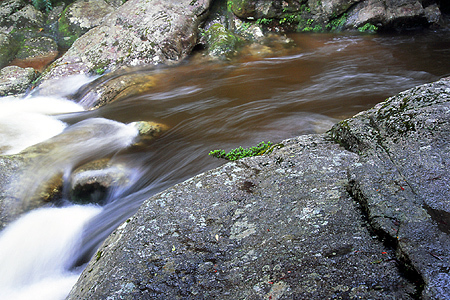 However, you'll be reached the massive tree by going to upstream with the Anbo forestry road. It needs 30 minutes with a car. A little bit ahead of the Kigen-sugi,There is another big sedar Kawakami sugi. Kigen sugi　estimated 3000 years old. 8.1meters around the chest. 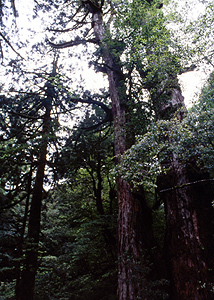 Jyamonsugi　2000years is estimated and having 8.3 meters chest. 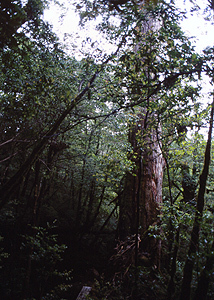 The tree is known with having the old trace of cutting. It must be a evidence for the tree was considered as not worth to cut. Like this example. Older trees having the wrong properties for lumbering have remained. Hahakosugi　2600years. Two trees stand together. Tenchusugi　1500years. 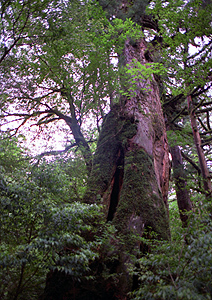 33.8 meters height is uncommon for older Yakusugi,Therefore, the tree must be called the pillar to the sky. Sanne sugi　1100 years. Budda sugi　1800yaers. 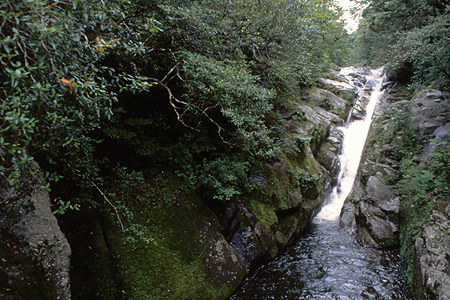 showed rugged features. 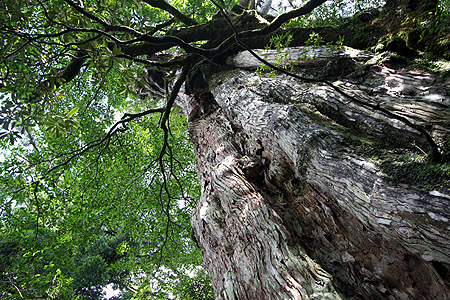 Kawakami sugi Massive tree having the 8.9 meters chest is the side of road Anbo-rindo. Torn to the south at the cross Miyanourasyo which positioned next to the Miyanoura ohashi bridge and in front of the school, the road 594 begins. The road climbing to the 700 meters above sea level mountain area taking a course along the eastside of the river Shiratanigawa and finishes the Shiratani-unsuikyo park. There is scheduled bus operation from the Miyanoura port to the entrance of the park in tourism season. Small admission is required. 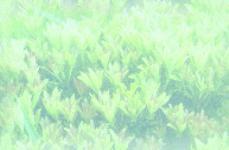 Soon after entering the park, a branch for Yayoisugi appears. 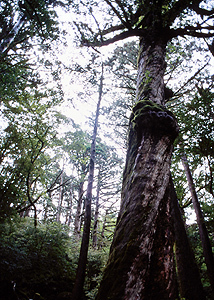 Take the trail to the Yayoisugi which one of the bigest cedar tree which have 8.1 meters chest. After 30 minutes walk, the trail joins the trail Unsui-hodo begun another way of the previous branch. If you want the shortest trip, Just go back from here taking the Unsui-trail downs along the gorge of Shiratani unsuikyo. Otherwise taking another way from here, soon you meet the trailhead of the Genseirin-hodo with which you will enter the more deep forest area of the park. 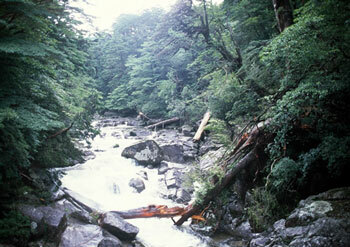 Over one hour walk with crossing several streams in the forest, you will reach the hut Shiratani-Sanso. The concrete made hut was built for the mountaineers who use trail Kusukawa-hodo which leads the Okabu-hodo with providing the facilities, in other times. But now it is just for the place for rest. Genseirin trail is joined to the Kusukawa-hodo next to the hut. Kusukawa-hodo is an old path used for approaching the inner forestry areas with climbing the Tuji-toge pass which has 979 meters sea level. From here, about 30 minutes walk in the mossy floor of the cedar forest is remained to the pass. Less one hour descent from the Shiratani-sanso with taking the Kusukawa-hodo, you will be back to the car parking directly. Also with crossing the bridge over the gorge, you can back to the entrance of the park. 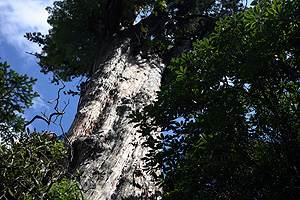 A big tree stands around 700 meters sealevel, which is known as one of the oldest ceader tree and giving easy access. Triplets cedar stand along the trail Kusukawa-hodo.You can reach there with descent from the car parking, although it is uncommon to visit. 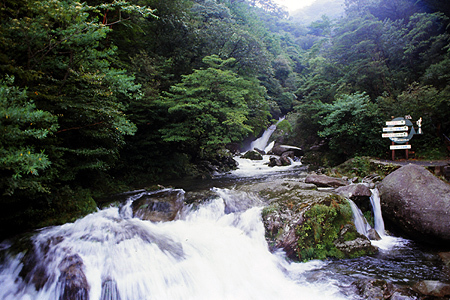 A map from the Yakushima tourism association. Copyright (C) 1997-2009 Masashi Koizumi. All rights reserved.